The recent Israeli strike against numerous Hamas targets reminded us of the Middle East risks premium that may not be fully priced into the markets. The Middle East situation may indeed represent one of those "tail risks" (discussed here). The rising uncertainty sent crude oil prices sharply higher, reversing earlier declines. In recent weeks, the energy markets have been focused on increased OPEC output, as the organization is now exceeding its crude oil production quota (30mm b/d). 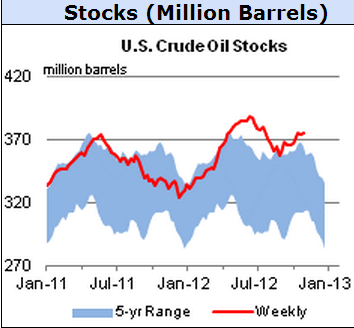 The markets have also been responding to rising crude supplies in the US (chart below). 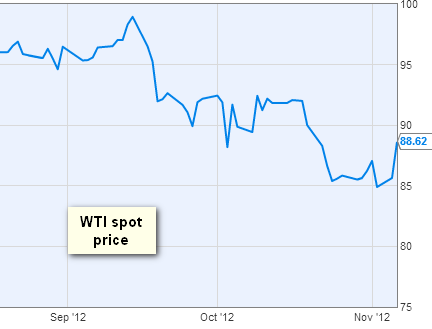 The fundamental backdrop for crude oil has definitely been weak recently. But now there is a possibility that Israel may expand its operations against Hamas, possibly with a highly unpredictable outcome. What makes the situation particularly volatile is that Hamas and other organizations and even governments in the region may no longer have the ability to control their supporters and citizens. The Guardian: - ... the risks of a major military operation [by Israel] in the changing landscape of the Middle East are enormous. In Gaza itself, the emergence of radical militant organisations, largely beyond the control of the ruling Hamas, make the consequences of Israel's operation highly unpredictable. Hamas itself has felt the heat from these ultra-extremist groups, whose members claim the ruling faction has abandoned military resistance against Israel for the comfort and privileges of quasi-government. These jihadist groups have close ties with militants in the Egyptian Sinai, just across Gaza's southern border, which Israel says are driven by an ideology akin to that of al-Qaida. They are disinclined to listen to Egyptian government mediators, who have brokered a series of ceasefires following escalations of violence. With global food prices elevated, risks of social instability in the Middle East are quite high. A major Israeli military action could ignite unrest across the region. In spite of weak fundamentals, the risk premium is beginning to be priced into the energy markets.